In Vietnam’s north, the capital Hanoi, is regarded as one of Asia’s loveliest cities, with scenic parks and lakes, tree-lined boulevards and history-drenched architecture. Despite increasing development, this ancient city still retains a unique charm and cultural traditions. At a dinner in Hanoi, we meet with a Non-Governmental Organization (NGO) representative for an insightful overview on Vietnam’s poverty and current humanitarian projects. We head southwest of Hanoi to a small rural village, where farmers mainly cultivate flowers to supply the city’s wholesale markets. Standing in vast flower fields, we roll-up our sleeves and lend a hand to the flower farmers. Our daily farming tasks run from clearing grass and watering flowers to loading-up motorbikes. While the farmers appreciate our help, this is also fun educational trip for all the family! Located on Hanoi’s outskirts, Non-Governmental Organization (NGO) ‘Hold the Future’ has been successful in creating livelihoods for young disabled people in Hanoi and other provinces. Because of their disadvantaged position in society, it is difficult for these youngsters with disabilities to find work. This NGO’s main mission is to offer them vocational activities and necessary life skills and support, enabling the disabled youth to lead more independent lives. Specialised training programmes cover health care and rehabilitation, vocational training and placement, through to paid employment. A half-day spent here lends a remarkable opportunity to learn how these disabled children achieve their goals. We also engage with them while they produce traditional handicrafts, the proceeds of which, help fund the centre. 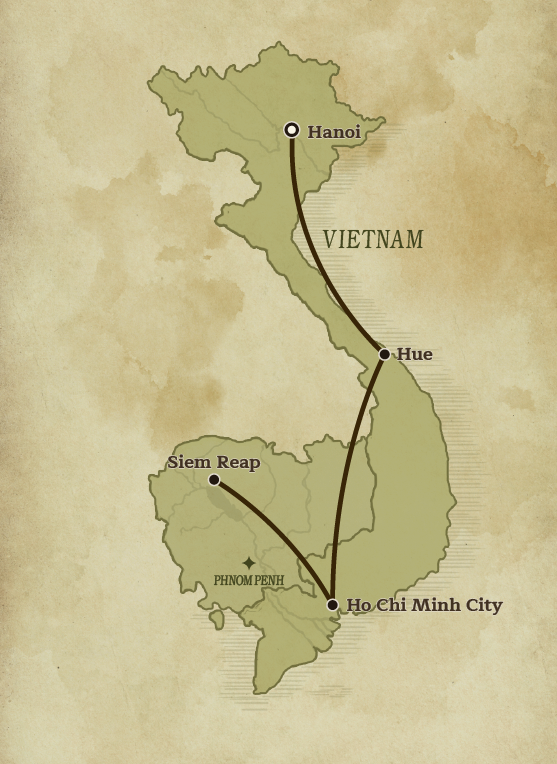 In Central Vietnam, the Imperial City of Hue was Vietnam’s former capital and home to 13 Nguyen Emperors; it is now a protected UNESCO World Heritage Site . Remnants of this majestic royal past are still evident today with the walled Imperial Citadel, Emperor’s mausoleums and royal court culinary heritage. Hue is also Vietnam’s centre of Buddhism and home to numerous Buddhist Pagodas. One of these, Um Dam Pagoda, is actually home to an orphanage and around 50 orphans. During our visit here, we meet the orphanage’s main representative and learn more about their efforts to take care of the orphans, logistical aspects and Buddhist philosophy. There is also plenty of opportunity to chat with the orphans, learn more about their dreams and engage with them in their daily activities. We drive to Hue’s outskirts and the surrounding scenic countryside to the small farming villages. It is here that we make a small benevolent gesture, helping out the local communities. A gift of just one cow can make a huge difference to the poor farmers in this region. Together with the local authorities and villagers as witnesses, we participate in a special ceremony during which we donate a cow to a local farmer. After this memorable experience, there is time to chat with the family and recipient of the cow. Meeting the village farmers gives us a better understanding of the challenges they face, besides their dreams for the future. The former Saigon, Ho Chi Minh City, is Vietnam’s largest city and a dynamic, rapidly developing metropolis, divided-up into a series of distinct districts. We head to District 5, also known as Chinatown (Cholon). Here we find Bung Sang, a private residence and school for around 50 blind children, founded by a benevolent blind musician. Now run by Sister nuns, Bung Sang focuses on helping blind children born into impoverished families from Vietnam’s remote provinces. We meet the school manager for a better understanding of the blind children’s lives, meet the children themselves and listen to them singing and performing music. Afterwards, a visit to Noir Restaurant, with their ‘Dining in the Dark’ culinary concept, replicates what it is like to dine for a blind person. The Mekong Delta is a sprawling region of intensively cultivated land totally dominated – and dependant on – the Mekong River, an integral part of local daily life. The nation’s largest rice farming region, Vietnam’s ‘Rice Bowl,’ produces nearly half of Vietnam’s annual food crop. The picturesque landscape is dominated by luscious rice paddies and fruit orchards. Due to the Mekong’s myriad of tributaries and canals, this is the only region in Vietnam where boats are the main form of transport. Sampan boats are a crucial factor to making a livelihood here, yet some families can’t afford to buy one. In a specially arranged ceremony witnessed by local authorities, we donate a sampan to one family in need. This ensures a brighter future for the local recipient. We also have time to chat with the villagers about their livelihoods. In northwest Cambodia, Siem Reap is the gateway for Angkor Archaeological Park, Cambodia’s main drawcard. This UNESCO World Heritage site contains the stupendous remains of the ancient Khmer Civilization. Siem Reap however offers a lot more than this. We spend the afternoon exploring some of the more fascinating establishments in downtown Siem Reap, such as Artisans d’Angkor. This company is well-known for its success in reviving and showcasing traditional Khmer craftsmanship, covering exquisite silk production, silver plating and stone carvings. They also help provide long- term employment for rural artisans. The day’s highlight is at Wat Damnak, one of Siem Reap’s most important and largest pagodas. Here, we receive a personal blessing from one of the resident Buddhist monks. Today is spent exploring some of the astounding temples within Angkor Archaeological Park. One of the largest, 12th century Ta Prohm, is iconic for a mass of overgrown fig tree roots bursting through the temple’s massive stone blocks. We continue to Angkor Thom, an entire inner walled city, which served as the Khmer Empire’s ancient royal capital from 1181. The centrepiece, Bayon Temple, is distinctive for its 216 giant, serene faces carved into stone towers. The early 12th century Angkor Wat, however, is the Park’s crown jewel. It ranks as one the world’s greatest ancient wonders and largest religious monument. Surrounded by a 190m (624ft)-wide moat, amongst its five stunning towers, the central tower symbolizes Mt. Meru which, Hindus believe, is central to the Universe. 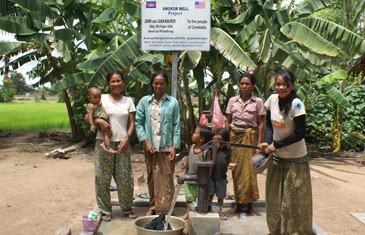 Running water in Siem Reap is a scarce commodity. Locals in the surrounding communities invariably have to trek miles to neighbouring villages to find potable water. Together with local workers, we build a water filter, which allows rain or lake water to be treated to a level that is safe to drink. We then take the water filter to a village and with assistance, install this at the home of a needy family. 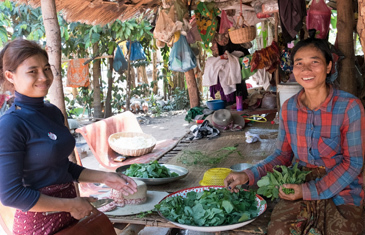 Later, a chef guides us around a private farm and then a traditional Khmer village. At the latter, we engage with the villagers and select key ingredients for our cooking class. As a goodwill gesture for their hospitality, we donate goods to the villagers in a special ceremony. Back at the farm, chef helps us create a three-course lunch, showcasing iconic Cambodian dishes and our just-picked village ingredients.